"Cloak and Dagger: Eyes of Buddha"
Buddhism is an ancient religion it was first practiced in the 5th century BCE. It spread from the Indian Subcontinent throughout Asia. It is estimated that between 350 million and 1.7 billion people follow Buddhism in some form. It is considered one of the fastest growing religions in the world, although Buddhism is not clearly understood by most Westerners. 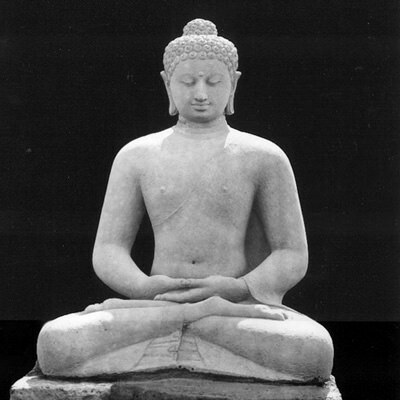 Buddhists follow the teachings of Siddhartha Gautama, and the title Buddha means "Enlightened One". The Buddha taught that the way to end suffering was to eliminate ignorance and increase understanding or enlightenment. Throughout Asia, there are many statues which represent the Buddha in many different forms and poses. These range from simple tourist trinkets to gigantic gold plated edifices, from priceless figurines to ordinary ceramic pieces. It is usually these statues that we find in Old time Radio Detective shows. Usually the figurine is more valuable than the characters realize. It could be the other way around- the Buddha might seem like a priceless treasure when it is actually a curio shop trinket. Whichever way it goes, the Buddha statue on the Radio represents a mysterious connection to the Orient, as well as good fun for radio mystery and Detective Fans. Johnny Dollar had a pair of Buddha encounters. The "Amida Buddha Matter" involved tiny statue send to a pair of newlyweds from an eccentric uncle who is making a movie in Korea, when the husband mysteriously dies in a house fire. Later, the "Man with the Action-packed Expense Account" investigates a valuable jade sculpture which is supposed to be locked up in Boston but shows up on the market in Paris in "The Meiling Buddha Matter". Chandu the Magician finds a treasure map hidden in a Buddha figure while Blackstone the Magic Detective and his companion Rhoda explain the secrets of "The Whispering Buddha" and how it involves black market gasoline smugglers. On True Detective Mysteries, a weatherman seems to be the victim of a simple chloroform overdose until the detectives find a secret Buddhist temple in his house in "The Buddha Man Mystery". Charlie Chan travels from Honolulu to Maui chasing the thieves who stole a priceless ruby known as "The Eye Of Buddha". A suspicious character on a neighboring yacht commissions Capt Carney to carry a booby-trapped Buddha statue ashore in Honolulu in the "White Jade Buddha" episode of Voyage of the Scarlet Queen. Cloak And Dagger's episode entitled "The Eyes Of Buddha" opens with a news bulletin about the War in Korea, a later describes a mission to Siam to seek Royal help to rescue an American flier from the Japanese. The Falcon investigates a shady character named Bridges who wants to by a rare Buddha in the "Burning Bridges" episode. So beware of the ways of the Mysterious East and enjoy our Buddha in Old Time Radio Collection! Be the first to comment on "Buddha"